A celebration of women's contribution to science fiction, from established classics to the work of coming stars.Women have always written powerful, important science fiction stories. 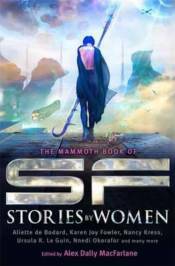 This anthology showcases the most exceptional stories written by women in recent decades, from classic stars Ursula K. Le Guin and James Tiptree Jr, science fiction greats Nancy Kress, Lois McMaster Bujold and Karen Joy Fowler, new award-winning talents Elizabeth Bear and Aliette de Bodard and many more! Whether crossing the stars or constructing the future of our planet, women's contributions to science fiction are unforgettable.